After my Friday night plans to attend Norman Music Festival were drowned out by a Spring thunder storm and then pelted on by hail, I decided to rest up in preparation for several hip-hop acts on Saturday. aDDLib was first on my agenda. The rap crooner has played the festival three years in a row but this was his first time with a band. Complete with a guitarist, a drummer, and an amazing young man playing an electric cello, this was different from any aDDLib performance to date. His well known love songs sounded even more romantic with the accompaniment of the live band. Women in the audience were wooed into submission as he spilled his heart out about the girl of his dreams and as well as relationships that became a nightmare. He was joined on stage by fellow rappers Original Flow and Chris McCain who helped perform their new track The Axis. Giving off mellow yet confident vibes laced with heartfelt lyrics, aDDLib’s set was a refreshing one for the thirsty concert goer. 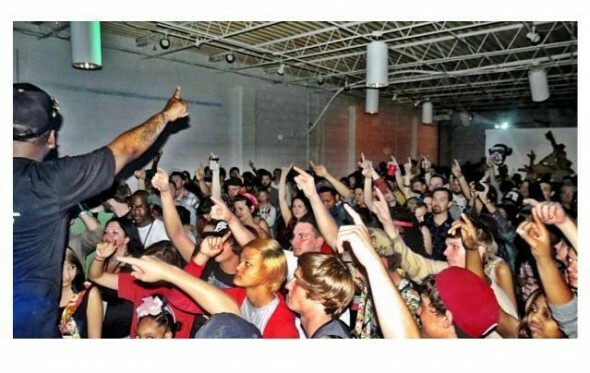 Jabee did what he does best every year at Norman Music Festival: put on a show. While most rappers showed up just to rap, Jabee showed up with a message. Complete with all the frills and trimmings, his performance was something unseen from any rap artist in the state. Having seen Jabee perform probably over 100 times, I thought I was prepared for what I was about to see. He proved me wrong in the best way. Before Jabee took the stage, a projector displayed a video package onto the wall behind the stage of past performances and music videos to hype up the crowd for what they were about to experience. Throughout the performance, images of Michael Jackson and Angela Davis amongst others were projected behind him. Just a few of Jabee’s heroes. Along with crowd rocking tracks like Go & Tell ‘Em and How to Fly, he also brought some substance to the hip-hop stage with songs One. One tells the heartbreaking story of the rapper’s younger brother being shot and killed. The whole crowd holds up one finger at his request. A hush came over the crowd as he told the story and then made a powerful statement, “I feel like if I have the opportunity to talk to this many people at once, I should do more than just talk about how cool I am. What if when Martin Luther King was speaking, he only talked about how cool he was?” That statement had the crown roaring so loud that I forgot that I was still in Norman, Oklahoma. All in all, the hip-hop stage at NMF was taken to a new level this year. And I know that next year will be even better. Tagged festival, Friday, Go Tell Em, Jabee, lyrics, Martin Luther King, music, NMF, Norman Music Festival, ONE, Original Flow, Shannon Moham, video. Bookmark the permalink.